← PhD students – do you want learn how to engage people with your research? “Yes, but why?” There were still questions about why do researchers need to do this. Even though I ran through the 10 benefits to researchers on the generic ORCID slides – ORCID for researchers. The message needs refinement and I’ll create custom slides in the future. Permissions – the level of permissions on an ORCID record and the way we replicate this in connecting ORO to ORCID needs better explanation and execution. It’s reasonably complex and we need to think about better user experience. “It doesn’t work!” – and it didn’t work for those profiles that had works with abstracts of more than 5,000 characters. ORCID has a character limit on their “Long Description” which threw a spanner in the works. Alan is fixing this! Is it like ResearchGate/Academia.edu? Well no, not really. 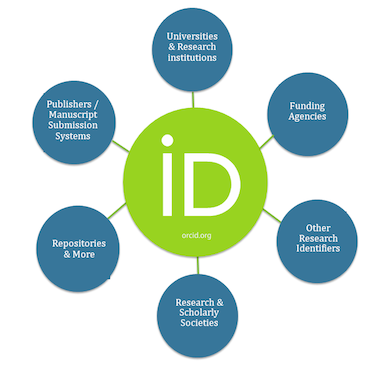 ORCID is primarily about disambiguation and connecting authors with their various outputs via persistent identifiers. It’s not primarily about networking with peers – but it should aid discoverability and help make connections. Does it auto-update with everything we now add to ORO? Erm, it will. Once the auto update is working everything that has subsequently been added to ORO will auto update. And then going forward whenever a new paper is added to ORO it will be pushed to ORCID shortly after. So keep on adding to ORO and once the auto update kicks in, ORCID will look after itself. The development is still best considered in beta and only those people who signed up for the session had the ability to link ORO to ORCID. It’s not available to all ORO users by default. However, if you want to be able to do (if you do please email the Library Research Support team). At this stage it’s probably best to do this on a one to one basis or in small groups. 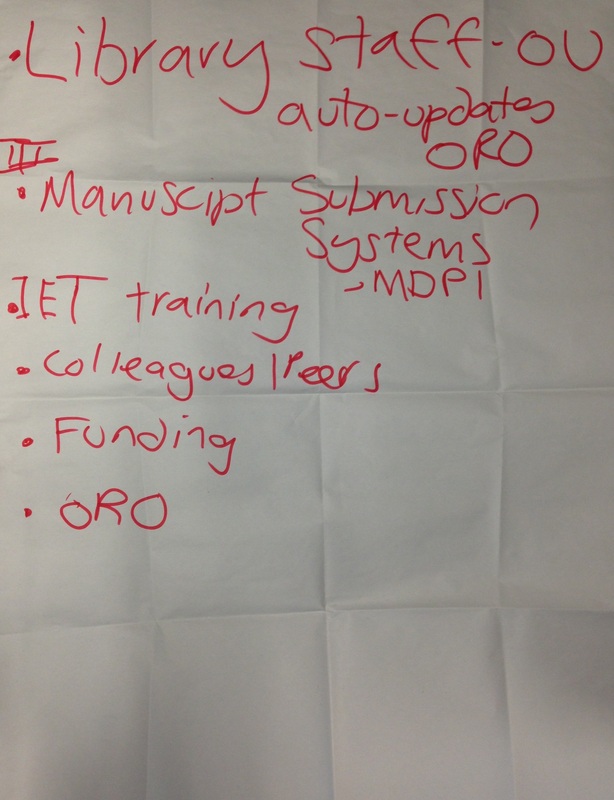 And one last thing… we did a very short flip chart warm up where I asked people “Where, or how, did you find out about ORCID” which was instructive. Most people who had encountered ORCID had been prompted to add an ORCID by publisher or funder submission systems. So people had created ORCIDs in order to complete the submission of an article or a bid… and probably hadn’t done anything with their ORCID account afterwards. So what’s the wider impact of this – researchers signing up for ORCIDs to comply with funder publisher requirements but not really knowing what it’s for, or what to do with it? Zombie accounts we called them… and that’s a problem. This entry was posted in Library research support, ORCID, ORO. Bookmark the permalink. Some really useful insights there Chris, from the coalface – thanks very much for sharing this. Did you encounter any duplicates in this session? Reactions on the potential for duplicates and user feedback on users managing them from within ORCID would be useful too.